Artisan Modern Scottish Restaurant – Whisky Galore! 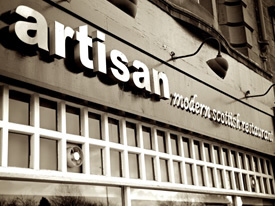 In 2008 Derek Mather opened the Artisan Restaurant in the heart of Main Street Wishaw. As Owner and Chef, Derek has provided his diners with a comfortable, relaxing and atmospheric surrounding. Ideal f or family meals and romantic dining. Derek has some wonderful menus, all offering freshly cooked meals with produce from many local and further afield Scottish producers. These include Stornoway Black Pudding, Arbroath Smokies, West Coast Mussels, Lanark Haggis, Home made Burgers, Scottish Cheeses together with making his own Cheesecakes, Ice Creams and Sorbets. As you can see Derek does pride himself in cooking the finest of meals using the finest of produce. Over the years Derek has amassed a huge collection of Whisky (Scotch, Irish, Welsh, Japanese, Bourbons to mention a few). He has approximately 1800 bottles of which almost 1200 are opened and can be tasted. 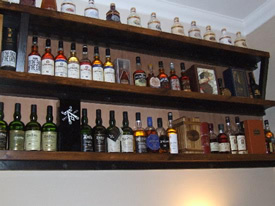 These Whiskies adorn the walls of his Restaurant and many a diner takes time to look at his wonderful collection. 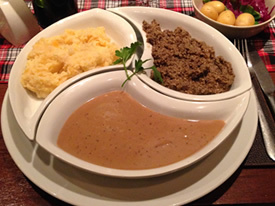 The Whisky lovers will be pleased to know that Derek uses some of his finest drams to make sauces that accompany his burgers, beef steaks and daily specials including pork and lamb. Last Sunday Jim and Nicola took our spouses, Jacqueline and Scott together with Nicolas two daughters Loren and Carla for a pre-theatre meal and a couple of drams. 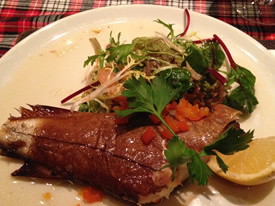 Our meals were exceptional, the starter of Arbroath Smokies should be renamed the Arbroath Whale Smokie, as the portion was huge. This is a feature of The Artisan restaurant, the portions are oversized and no one will leave feeling hungry or peckish. We had soup, steaks, pasta, haggis and a selection of sweets including a mind blowing Parma Violet flavoured home made ice cream, WOW. Jim finished his meal with a wee Laphroaig and Nicola had a 21 Year Old Glen Scotia. So, if you enjoy fabulous food, you really need to go here. If you enjoy choosing a dram from one of the Scotland’s finest selections, you really need to go here. If you enjoy fabulous food and outstanding drams, wonderful service, friendly atmosphere, you really need to go here. The best things about The Artisan restaurant is that Derek is more than happy to come out of his kitchen and chat to diners and give his recommendations, and the bill will not be a bank breaker, on the other hand it is outstandingly affordable. This is not The Whisky Boys first visit and it will not be our last, thanks again to Derek and his staff for a grand night. Please check out Derek’s website for menu’s and prices, together with a details of his Whisky collection. You really need to go here. The Artisan Restaurant, Wishaw. Previous story Dramboreeeee! Paradise for Whisky Thrill Seekers!